It always amazes me how many Unix people do not know about the command: apropos. It’s fabulous! a2ps (rpm) – Converts text and other types of files to PostScript(TM). zip (rpm) – A file compression and packaging utility compatible with PKZIP. zisofs-tools (rpm) – Utilities for creating compressed CD-ROM filesystems. zlib-devel (rpm) – Header files and libraries for Zlib development. Since linux handles files really well, there are actually a LOT of possibilities for “file”. On my system, over 1600. Configuration files such as .conf are of type (5). The commands that can be used at the prompt are of type (1), and (8). By adding grep, you can narrow the results. But I still get over 600 possibilities. At this point, you can scan visually. Or, use grep some more. makewhatis creates the whatis database, by reading key sections of all the man pages. When I worked on Sun Microsystems operating systems, I remember the equivilent command was catman. Either will take a number of minutes to finish. It’s write once, read many, so you just need to do it the once. Then, you can also use the command: whatis. This is useful when you are instructed to use a command online you haven’t seen before. Before running the command, you can check what it does. Other useful commands that I use include, which and file. You then always can use the man pages for more info. Go to SEE ALSO for related commands. One of my beefs about the man pages is that they often tell me everything, except what I need to know. In fact, for apropos, the critical fact that you need to first run makewhatis is not found at all in SEE ALSO. Perhaps that’s why it’s not used much. Usually I just need a simple example that works. I find I get much better info from blogs these days. Why can’t those who write man pages do similar? Using apropos has allowed me learn many things about unix and linux that I would not have discovered otherwise. You can spend a lot of time with it, and learn heaps. Viruses, worms, trojans, and rogue antispyware software are getting pretty sophisticated. As careful as I am, one caught me today, on a computer I don’t usually use. Usually I use Firefox. But I opened up Google Chrome, right clicked on a link, and open in new window. 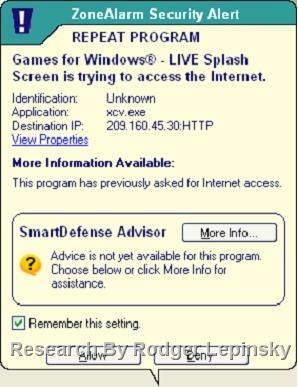 Suddenly, I got one of those phony webpages telling me that I had a virus, and doing a scan. Zone Alarm did not catch it, which is pretty disappointing. I set it to deny, as I usually do, but it still executed.